AvisFV is a FITS viewer for Windows 10, 8, 7, Vista, XP (compatible also with most Linux and Mac if WINE is installed). FITS images are used in scientific applications like astronomy and medical imaging. 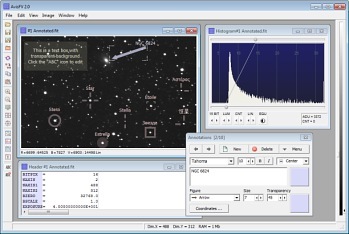 AvisFV means "Astro-vis Fits Viewer" and it's 100% free software. Opens FITS files: (8, 16, 32, 64 bit), integer and floating point. Drag & drop from Windows Explorer and other file managers. Saves FITS, TIFF, PNG, BMP, JPEG, (8, 16, 32 bit) and allows to modify the FITS Header as a text file. Real-time change of visualization with the mouse wheel or keyboard. Many transfer functions and color palettes included. Annotates images (text, figures, etc.) and saves all annotations as comments into the FITS header. Fulldome animation "The solar system".